On 5 February 2019, Datuk Prof. Emeritus Dr. Kamarudin Hussin, Chairman of the University Board of Directors and executives from Universiti Malaysia Perlis (UniMAP), Federation of Malaysia visited Thammasat University. The delegation were greeted by Rector Gasinee Witoonchart along with Assoc. Prof. Dr. Kitti Prasirtsuk, Vice Rector for International Affairs and Dr. Chaiwat Meesanthan, instructor from faculty of Liberal Arts. Both sides discussed on possible academic collaboration and signed the Letter of Intent (LOI). Datuk Prof. Emeritus Dr. Kamarudin Hussin also invited Rector Gasinee to visit UniMAP in Malaysia. On 31 January 2019, Asst. Prof. Dr. Supranee Lisawadi, Assistant to the Rector for International Affairs, Assoc. Prof. Dr. Sitthiphon Kruarattikan, Director of Institute of East Asian Studies, and Ms. Usacharat Vejpongsa, Director of the office of International Affairs met with Prof. To-Hai Liou, Vice President for International Cooperation, Prof. Fu-Kuo Liu Dean of Innovative International College from National Chengchi University, Taiwan, Ms. Tzu Yi Hung, Second Secretary of Education Division, and Ms. Noparat Asawamat, Commissioner of Education Division, Taipei Economixs and Culture Office in Thailand. Both sides discussed on possibility to expand student exchange collaboration in short program or language and culture program. On 29 January 2019, Prof. Lily Kong, President, and delegates from Singapore Management University (SMU) visited Thammasat University. The delegation met with Rector Gasinee Witoonchart along with Assoc. Prof. Dr. Kitti Prasirtsuk, Vice Rector for International Affairs, Deans and executives from Thammasat Business School and College of Interdisciplinary Studies. Both sides discussed on possible academic collaboration and exchanged views on education strategies, particularly those on business and interdisciplinary studies. On 24 January 2019, Prof. John Hamilton, Special Assistant to UCLA Vice Chancellor and Provost from University of California, Los Angeles USA along with Ms. Sonia Luna, Executive Director of the UCLA California Nano Systems Institute (CNSI) visited Thammasat University and met with Assoc. Prof. Dr. Kitti Prasirtsuk, Vice Rector for International Affairs, Assoc. Prof. Dr. Chalie Charoenlarpnopparut, Vice Rector for Academic Affairs, Assoc. Prof. Kammal Kumar Pawa MD., Vice Rector for Human Resources, Assoc. Prof. Dr. Supasawad Chardchawarn, Vice Rector for Administration (for Tha Prachan and Pattaya Campus), Asst. Prof. Dr. Attasit Pankaew, Assistant to the Rector for Communications, Assoc. Dr. Nuntavarn Vichit-Vadakan, Dean of School of Global Studies, Dr. Richard Carhart, Associate Dean for Academic and Student Affairs of School of Global Studies, Assoc. Prof. Dr. Supachai Srisuchart, Director of Institute for Continuing Education and Human Resources, and Prof. Prakitpunthu Tomtitchong MD., Associate Dean for Administration and International Affairs of the Faculty of Medicine. Both sides discussed on academic and research collaboration. Also, the delegates visited Thammasat University Pattaya campus and discussed on possible collaboration such as wellness and innovation at Pattaya Campus, joint online courses and executive programs. On 29 January 2019, Asst. Prof. Dr. Supranee Lisawadi, Assistant to the Rector for International Affairs met with Prof. Keisuke Maruyama, Director of International Affairs Division and Mr. Keiji Shinomiya, Deputy Director of International Affairs Division from Doshisha Women’s College of Liberal Arts, Japan. Both sides discussed on student exchange program as well as exchange student information, and DWC’s inbound programs. 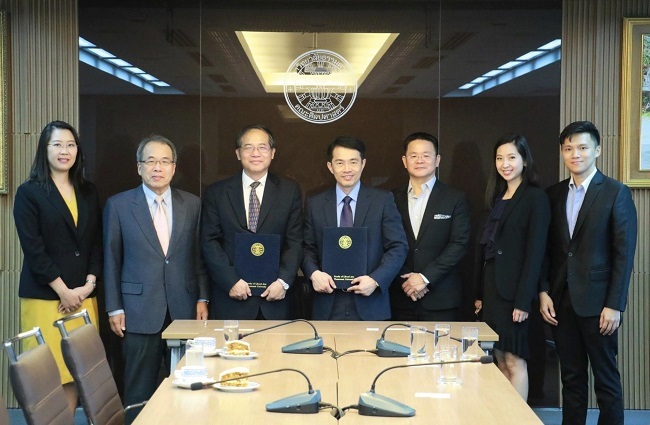 On 22 January 2019, the Faculty of Liberal Arts, Thammasat University and Institute of China and Asia-Pacific Studies, College of Social Science, National Sun Yat-sen University, Taiwan signed the Addendum to the MOU with at the Faculty of Liberal Arts, Thammasat University (Tha Pra Chan Campus). The addendum to the MOU is aimed to facilitate cooperation between two institutes such as Cooperative Education Program from Bachelor’s to Master’s, academic exchange and visits between both parties, and research and publication of their faculty members.